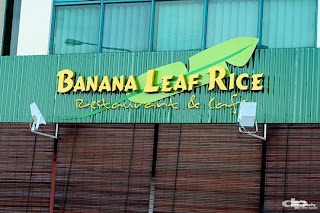 Something new in Miri: Banana Leaf Rice. Located across Ipoh Kopitiam at Centrepoint where you can see it when you are driving towards Tanjong Lobang direction. Everything is served on a fresh piece of banana leaf with 4 different mixture of vegetables and little amount of meat to go along. 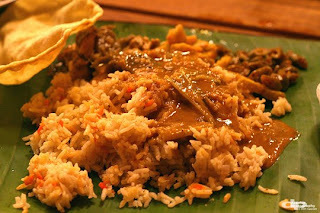 You can have them either with plain rice, or briyani rice which add another RM1 on top of its price. Crackers are also served as part of the meal. The great thing about this meal is that you get to refill during the meal until you are satisfied. 3 great sauce to go with the rice: curry chicken, curry fish or dal (if i have spelled correctly). 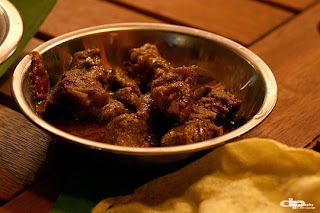 If you need extra meat to go along, you can order curry and deep fried dishes varies from chicken, fish, sotong, prawn, cockles and more. d foods so delic...bt d service tooooo slow!!! !can ask them recruit more staff kah? 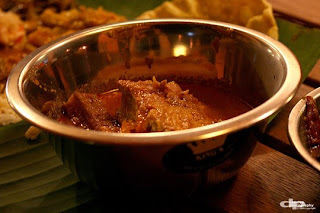 hello 2 all staff of banana leaf...i realy miss the food,to boss anba,thanks 4 everything,,,,see u soon..